A s mart cook always has certain staples in the pantry or freezer. Besides the obvious, like flour, sugar, onion, garlic, celery, carrots, butter, and milk, there are some things that I always have on hand: tomato sauce, tomato paste, French onion soup and various broths (chicken, turkey, Thai), dried pastas and rice, frozen peas, frozen hamburger, steaks, and chicken breasts, frozen puff pastry, frozen nuts (walnuts, almonds, pecans, and pine nuts), shredded cheeses, and albacore tuna in water. Always. I can concoct a gazillion recipes from that combination. Tuna noodle casserole seems to have been a staple of everyone’s childhood. Everyone but mine. I don’t remember My Mother making it, because, in most households, it involved Cream of Mushroom soup, a staple in many pantries, but never in My Mother’s, because my family wouldn’t eat it. Instead, she made Tuna Burgers, what we now call a “Tuna Melt.” We’ll get to that some other day. Tuna is a tricky thing. There was a time when I didn’t eat it, and some people still won’t, for a variety of reasons (yes, I’m pointing a finger, and you know who you are). I only eat albacore, the white tuna, packed in water. The Veterinarian didn’t understand that. He was perfectly happy to eat that dark stuff packed in oil, when we were newly-married college students. “Look at how cheap it is!” he would insist. We compromised with light tuna packed in water. Mixed with a (very) little mayo, spread on white bread and consumed at football games with a Thermos of whiskey sours (one can lemonade, one can water, one can whiskey). One day, I discovered a recipe using Rice-a-Roni to make “Tuna Jambalaya” (ok, ok, don’t judge me or the recipe until you’ve tried it), which used enough sweet pepper to camouflage the taste of the tuna, but, eventually, I concocted my own tuna casserole recipe. I rarely eat pasta any more (since I created my own stupid diet that omits pasta, rice, and potatoes — it worked for me, but I hate it), so I rarely make this. In the bleak mid-winter, it does warm my tummy and my heart, especially with a glass of white wine. Preheat oven to 375°. Butter a 2-quart casserole dish and set aside. In a large saucepan, melt the butter over medium-low heat. Add onion and stir for 30 seconds. Gradually stir in flour, whisking until smooth. Cook and whisk for 30 seconds. Very gradually stir in the wine or Vermouth until smooth. Very gradually stir in the milk. Continue to stir until the white sauce (roux) has the consistency of a milkshake that slides effortlessly through your straw. Stir in the thawed peas, the tuna, and the cooked pasta. Gently toss to coat; spoon into prepared casserole dish. Top evenly with the shredded Swiss cheese. Bake in the preheated oven for 10 minutes to heat through and melt the cheese. Increase heat to “Broil” until the cheese browns lightly. Remove from oven and serve. A roux is a wonderful base for so many dishes. It can run from a thin sauce that is the basis for gravy or crème anglaise through the medium sauces for pot pies and scalloped potatoes to a thick, dark base used in Cajun and Creole cooking (that roux that the late Chef Paul Prudhomme called “Cajun napalm”). I never use a roux to thicken a soup. I prefer reduction of stock, a purée of vegetables, or a touch of sweet or sour cream. Two things are important in a roux, that it be smooth, which takes slow incorporation of the flour into the fat, and that it is cooked enough to dispel the “raw flour” taste, without burning it (unless you’re making a dark roux). Categories: Food, Recipes | Permalink. Winter finally arrived this week. I’ve pulled out my fleecy pullovers and leggings, and even the BFF won’t stay outside very long. This is the time of year when I’m glad I’ve stored up hearty soups and stews in my freezer. I’ve got French onion, beef barley, broccoli, butternut squash, and potato-corn chowder. Today, I want something with a little extra heat, the kind that comes from chiles. The kind that heats up your mouth as well as your bones. Today, I’m making chili with black beans and chopped lean chuck, so it’s extra hearty, too. Chili is one of those syncretized American foods, like pizza, whose closest origins are in Italy but became an entirely different type of food when it got to our shores. Chili began in the southwest, borrowing flavors and ingredients from indigenous people (beans, chiles, spices) and was adapted for mainstream palates. Certainly, Spanish settlers in the area brought stews with tomato bases, garlic, onions, meat, and, the most important ingredient, peppers, much as Creole cuisine developed in Louisiana and the Caribbean with Spanish, French, and African influences. See what wonderful flavors we get when we share? Chili is an opportunity to use all kinds of meat, because, with enough other vegetables, herbs, and spices, who knows what you’re eating? Once, when visiting The Veterinarian’s grandmother in Florida, she served us an intensely-flavored chili, sitting back and watching us with a smirk on her face. After we had finished cleaning our bowls, she revealed the secret ingredient, ground elk meat, which his grandfather had shot on a trip to South Dakota. 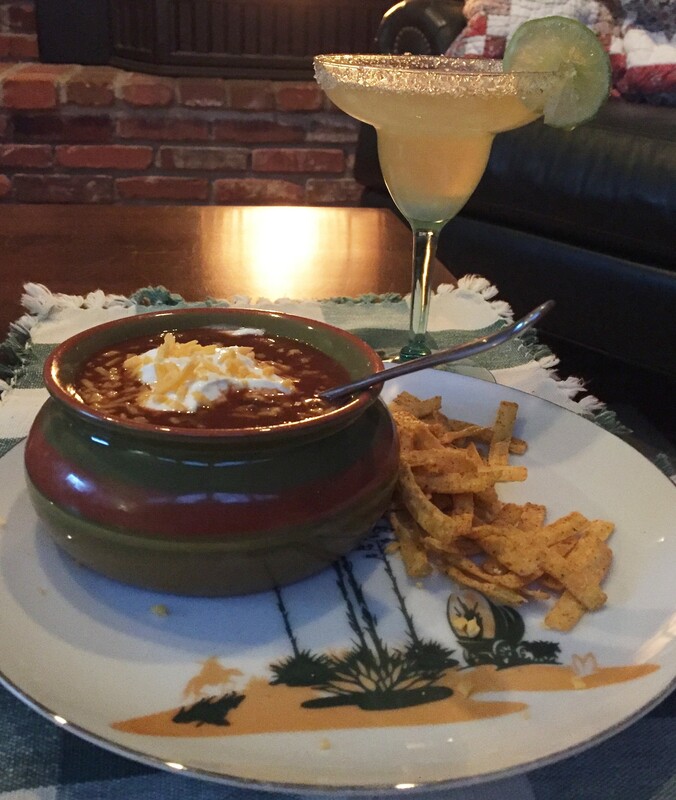 This is my syncretized version of American chili, using black beans, chiles, garlic, onion, and spices, garnished with corn tortilla chips and cheese. I recommend that you start with one jalapeño and add the chili powder gradually. While I like considerable heat in my chili, The Daughter and others do not. I don’t believe in hot for hot’s sake; the flavors should only be enhanced by the heat, not overpowered by it. And how do you temper that heat? Sour cream is good, but my favorite is that syncretized beverage, the frozen Margarita, or a frosty beer. Stay toasty, my friends! Cover beans with water and bring to a boil over high heat. Reduce heat and simmer for 1-1/2 hours. Add meat, onion, garlic, jalapeño, tomato paste, chili powder, oregano, salt, and cumin. Simmer 30 minutes, until thickened. Adjust seasonings. Serve with any of these garnishes on the side: chopped sweet onion or scallions, shredded Monterey Jack or sharp Cheddar cheese, queso fresco, sour cream, tortilla chips, shredded lettuce. Note 1: This recipe saves you from soaking the beans overnight. Yay! You also can substitute 2 cans of undrained black beans for the dried beans, and use 2 cups of water, but I like the texture of freshly cooked beans. If it is too thin, you can simmer it until thickened, or, if too thick, add a little water. You can also omit the meat entirely. Note 2: Take care when handling hot peppers. A pair of disposable gloves are helpful. Lay a sheet of paper towel on your counter. Over the towel, slice off the stem end and slit the pepper lengthwise. With the tip of a paring knife, flick the membrane and seeds (where most of the capsaicin — the volatile irritant in peppers — is contained) onto the towel. Roll up and discard, where children and pets can’t get into it. Still wearing the gloves, mince the pepper and add to the chili. Clean up your cutting board and knife, then discard your gloves. I recommend the gloves, because I, invariably, forget that I’ve cut up a pepper without them, and, even hours later, will touch my eyes or nose and burn myself! Maybe you won’t, but I thought I’d pass it along. Slice off stem end and slice pepper in half lengthwise. Peel the membrane and seeds from the pepper. How to chop beef: Slice into strips, then whack with a cleaver until it resembles very coarsely ground hamburger. Categories: Food, Recipes | Tags: black beans, chili, food, recipe, Super Bowl food | Permalink. I’m so glad winter is here. I didn’t think I would be, but I had a rough holiday season. I overate at parties and dinners and a tea and three luncheons. I sang cheerful and poignant holiday songs at least once a week for six weeks and put smiles on the faces of strangers. I gave gifts and got gifts and cards and letters and emails. And The Daughter introduced me to Peppermint-Chocolate Chip milkshakes at Chick-Fil-A. All that fun was exhausting. I needed to put on the brakes. If I had been a runaway train, at least I would have been moving and expending calories, but standing around with a glass of wine in my hand at a party doesn’t register much on my Fitbit. Everything that I ate, from Thanksgiving on, settled in parts of my body that hadn’t seen fat in months, and it needed to vamoose pdq, asap, or at least before I leave on vacation in a couple weeks, where I will be required to wear a bathing suit in public in front of people who know me. Mary See probably was making happy memories. 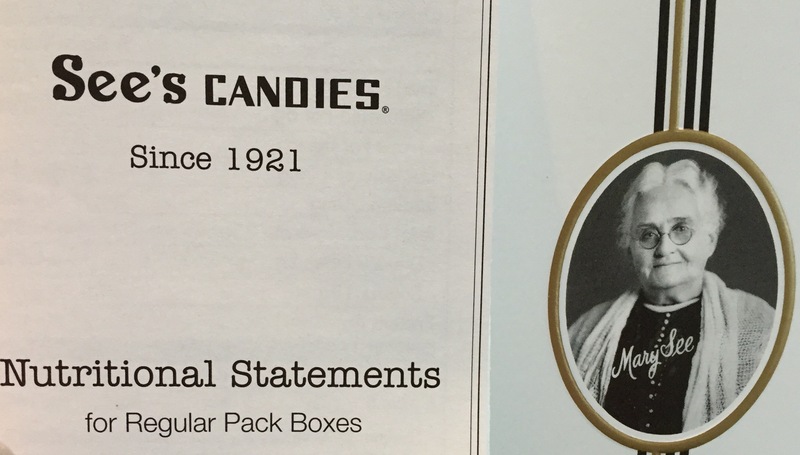 Did you realize that chocolates come with “nutritional statements?” I didn’t either, but they do. On the box of chocolates that My Sister gave me, they even break it down according to “milk” and “dark” chocolates. I’m partial to dark chocolates, which are higher in iron than milk chocolates. Milk chocolates have 2% of the recommended daily requirement of iron, while dark chocolate has 4%. That’s twice as much! Yay, dark chocolate! I checked my other Christmas treats, and, sure enough, there was a nutritional information sheet for the pralines. Who does not know that pralines don’t provide any shred of essential nutrients? They’re just sugar, butter, milk, and pecans, which are probably the most nutritious ingredient. Really, people. It’s c-a-n-d-y. No one expects it to replace any major food group, although it will probably be outlawed by next Christmas for my protection. Glad I stuffed myself when I had the chance. Plus, I ate potatoes. Well, you can’t have the Christmas standing rib roast without mashed potatoes, can you? What are you going to put the au jus on? The Yorkshire pudding can’t soak it all up. And no one would take the leftover mashed potatoes home with them, so I put them into a potato-corn chowder. Then, I made scalloped potatoes because there were potatoes left in the bag. I was tempted to make home fries or French fries or hashed browns, but I resisted. Instead, I baked one and ate it with butter and sour cream. I do that when I’m feeling content. I can’t eat when I’m upset. Like I said, I don’t make New Year’s resolutions because, what is the point? (see last year’s Resolutely Not Making Resolutions) I am not going to keep them. Oh, I try to be sensible. It seems reasonable for me to make changes in small steps. Yep. Two weeks is a reasonable length of time for my energetic (and somewhat scattered) brain to stick with something. On New Year’s Eve, on the verge of not making New Year’s resolutions, I made sure that I had eaten all of the sugary chocolates, pralines, cookies, and cakes that were gifted to me in December. And I vowed to plank every day. I failed with the sweets immediately. The Daughter and her beau came for dinner on Sunday, bringing the most amazing chocolate cake, a box of macarons, and — you won’t believe this — a “Red Velvet” cupcake, which is wrong for so many reasons. I could have killed her. PLUS, I made her favorite scalloped potatoes with the potatoes that were left in the bag from Christmas. I am my own worst friend. The cupcake, of course, was easy to resist, because there is no commercially-produced “Red Velvet” cupcake that will meet my standards. “Of course, I’m not going to taste it, but that chocolate cake looks like heaven.” And it tasted like it, too. For three days. About 4” in diameter and unfrosted, it had the rich flavor of cocoa and the texture of a Queen of Sheba cake without the almonds. I made her eat a quarter of it and then ate one remaining quarter a day. That was good, right? I was tempted to eat the whole thing after they left, but I resisted. I resisted eating the remaining half yesterday, just enjoying a quarter after lunch with a cozy cup of tea. Today, I made it until lunch time, when I finished it off for dessert with an espresso…right after I ate the leftover scalloped potatoes. Against all my principles, I tasted the Red Velvet without the frosting. The Daughter was right. It was completely tasteless. Whew! Saved a few calories there! Besides, it’s sub-freezing today, and I can use a little blubber to keep me warm. I still have the macarons to go, but I have planked every day and walked more steps than the minimum, so I’m actually feeling quite virtuous. I just need to take it slow and easy. Maybe if I take the first two weeks of each month and follow something. Planking this month and (mostly) avoiding dessert. Ok. What can I add on in February? How about avoiding dessert and keeping my closet clean for 14 days? Between February 1 and 14, I will put away, in its proper place, everything that comes out of the dryer and goes on a hanger. I will clip every skirt to its own hanger, carefully drape every pair of pants so it doesn’t need to be ironed before I wear it, put every shoe back on the rack, every purse on the shelf, every belt on the hanger, every odd sock in the sock drawer. I will fold every set of sheets and all the clean towels and put them on the shelf instead of tossing them on the chair next to my bed. That should work. The first two weeks of February will end with Valentine’s Day, and, although Lent starts on February 10, the 14th is a Sunday, which, technically, isn’t actually Lent (there are 40 days in Lent; you do the math). How virtuous! In my second week of my return to match.com, they have not found me one, single “mutual match.” That’s where they tell me what men are looking for what I have to offer. They’ve thrown a lot of “Maybe you’ll like this guy” (I paraphrase) at me, and now they’re giving me options from out of town. Way out of town. Like, Watkins Glen and Nyack, NY, Hampton and Virginia Beach, VA. I had coffee (that I purchased for myself) with a man one year younger than I who said he was retired. He looked and acted like he was 80. He didn’t want to talk about his children, his previous job, or his education. He said that he had been “in real estate” and fills his retirement hours “reading,” “playing a little golf,” and “travelling.” No volunteer work. No hobbies. He wasn’t even close to being “Athletic and Toned” (more like “A Few Extra Pounds”), and, apparently, has lost the ability to carry on a conversation. My BFF is more interesting. I’m not sure what else I could ask for. I’d like someone who can cook, but I don’t say that because it seems to be a rare commodity in a man, although the Veterinarian and many of his friends were great cooks. I’d like someone who knows when to wear a coat and tie, but that’s probably elitist of me, so I don’t say that. Match tells me that more new people sign up between Christmas and the end of January than at any other time of the year. I guess the competition is too stiff. Too many attractive younger women who don’t mind dirty baseball caps and sunglasses and suggestive t-shirts and motorcycles, who kayak and cycle and hike in the wilderness and — <shudder> — camp. You know what that means, don’t you? The guy is too cheap to take you on a real vacation in a real hotel with running water. And you get to do the cooking! Oh, well. I still have those macarons, so who am I to complain. Life is good (mostly). Soli Deo gloria! Categories: Dating, Health, Humor | Permalink. Tonight, we come to the second greatest event in Christendom, the birth of Jesus. Some will consider me an apologist for God, purveyor of myth (in the true meaning of a myth, I am), childlike (yep), superstitious (never), or simply irrational (sometimes). Some may say that Christians have co-opted other traditions (syncretism), commercialized a sacred belief (agreed), and/or persecuted those who aren’t “believers” (regrettably). But on this night, all I can see is the hope lying in a modest dwelling, not in a palace or floating on a yacht or drifting magically through the sky. The baby is human and real and vulnerable and generating the love and peace and hope that we appear, at first glance, to have so little of. It is the great mystery. It’s a gift. It’s irresistible. Seize it. O Magnum Mysterium, from the Matins said by the Church at Christmas, comes as close to expressing how I feel about Jesus’ birth as anything I’ve read or recited or sung. Two musical settings, written 400 years apart, particularly convey the mystery. The elder was written by the 16th century Spanish composer Tomás Luis de Victoria and the more contemporary (1994) by American composer Morten Lauridsen. Both are a joy to experience as a singer, the harmonies, dynamics, and movements telling the story as much as the words do. Listen to the simple, ancient words in any of the fine versions on YouTube. When caroling with friends, visiting shut-ins, or even singing in the bar of an upscale tavern, as much as we bring the good news of Jesus’ birth to our community, we share our own joy with one another. At one stop, we were even joined by a kennel full of foxhounds howling along (no, it wasn’t someone singing out of tune). In the clear, cold sky, Orion made his winter appearance, just as he did on that holy night. Same stars. Same creation. Same love. Same hope. 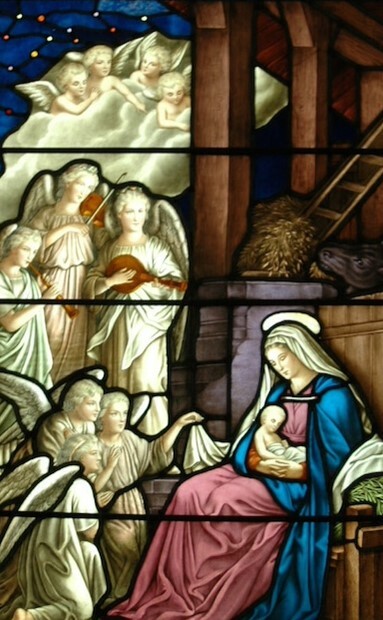 On Christmas Eve, as I sing with these same friends in the choir at the 265-year old church where I worship regularly, I will face this beautiful window. Floodlights outside will illuminate God’s beloved creation. The animals will breathe comfort. The angels will shine gloriously. Mary and her baby will glow. The mystery will be clear. Inside, the lights will dim when we sing “Silent Night” as the Eucharist ends, and most eyes will be damp. What moves us? Sorrow? Dementia? Hallucination? An evolutionary, even reptilian, reaction to sound waves? It’s a mystery. The Eucharist itself foretells the greatest event in Christendom that we will observe in a few short months. Another mystery. More improbability. More irrationality. More hope. All of these mysteries engender love and peace and hope, if we embrace them. It doesn’t mean that we put down our intellect or our reason. It doesn’t mean that we dominate others. All earthly life is messy. Scripture does not promise us otherwise. It promises that, in all the messiness of sin and pain and sorrow, God will continue to send that love and peace and hope that heals and sustains us. Gloria in excelsis! As I age, I learn that I don’t need an explanation for everything that happens. I know the nuts and bolts of life, the tools of physical survival, but the unmeasurable part of me, my faith, lifts me when I cannot lift myself. How does faith work? It’s a mystery, but to me, it’s very rational. Like planking, which strengthens my physical core, I work on it. As I work at staying in touch with friends, I work at staying in touch with God through prayer and study and fellowship and evangelism and stewardship, all of which are concrete and very real. Frequently, I fall, but others, who also see the mystery, are there to help me upward and onward. We are God’s gifts to one another. We are God’s love and peace and hope. So, who am I to complain? Life is good (mostly). Soli Deo Gloria! Categories: Christmas, Faith, Uncategorized | Tags: Christianity, prayer | Permalink.